Background: The quality of educational services is one of the major concerns of higher education officials. Evaluating the quality of educational services is expected to be based on scientific models. Currently, definition of this area and conceptualization of educational services quality suffers from theoretical and methodological ambiguities and the root of many of these ambiguities and complexities appears to lie in the lack of appropriate models and tools for evaluating the quality of services. Materials and Methods: The purpose of this study is to design an integrated model of educational services quality. To this aim, critically reviewing the models of the services quality is essential. This critical review was conducted using an analytical approach. Results: (a) Theoretical foundations related to the quality of educational services were determined. (b) The models of the service qualities were described, criticized and the common concepts of these models were extended to the field of education. (c) Models to explain satisfaction were also extended to the field of education. (d) With a creative mental synthesis, a summary of common concepts of service quality models, satisfaction models and related documentation, and an integrated model of educational services was suggested. (e) The relevance of this model was demonstrated with concepts related to educational services management. Conclusion: Experiences of experts, key informants and stakeholders about the quality of educational services and the perceptions and experiences of indigenous norms in this field are very important. The importance of universities in the development of skilled manpower along with changes in the administration role from direct control to monitoring the institutions, has led governments and university clients to consider the service quality in this institution scrupulously [1,2]. Today, service organizations and universities face the advancement of technology, cost reduction, government decisions, different budgeting policies and fierce competition which makes the provision of quality services the sine qua non of their survival . Educational services management in universities is one of the critical challenges for which staff is required getting prepared in this competitive environment. The provided services are in direct contact with the students. Most contacts of university students with the management depend on the performance of staff training services. Due to the high involvement of students with the offices offering educational services, they usually perform their assessment of the entire university (except evaluation of instruction) based on the performance of the staff of educational services. Educational services are expected to be provided in a way to give the clients the feeling they are in a safe environment and thus, are mentally prepared for their learning . In order to assess the service quality, more than 20 models have so far been introduced. These models are mostly related to the quality of services in the industry and market, and a few models have been introduced in the field of educational services and many researchers have tried to apply some of these models in the field of education. Each model highlights some aspects of service quality. The provision of an appropriate model to provide valid and reliable measurement tools in the field of management of educational services is essential. This study intended to design an integrated model of educational services quality. In this regard, critically reviewing the models of the services quality is essential. Adopting a an analytical approach, this critical review was conducted searching for specific keywords (Educational Services Quality, Service Quality, Customer Satisfaction, Student Satisfaction, Student Relationship Lifecycle (SRLC), Educational Services Management, Student Services, Customer Relationship Management, CRM, Student Relationship Management, SRM, Student Relationship, Service Quality Assessment, Academic Support, Student Affairs, Satisfaction Models And Measuring Customer Satisfaction) for a duration of 17 years, from 1997 to 2015 and finally 150 articles were evaluated in Persian and English. Theoretical foundations related to quality of educational services were determined. The models of the service qualities (Technical and functional quality model, SERVQUAL, Synthesized model of service quality, SERVPERF, Antecedents and mediator model and Attribute service quality model) were described and the basic concepts of each model were found. The service quality models were evaluated and their common concepts (customer orientation and satisfaction of services) were extended to the field of education. Also, models explaining satisfaction were extended to the field of education. Finally, with a creative mental synthesis, a summary of common concepts of service quality models, satisfaction models, and related documentation, an integrated model of educational services was designed. The relevance of this model was clarified with concepts related to educational service management. Methods are provided in the following seven steps. There are different approaches to the definition of quality. From a philosophical perspective, quality is synonymous with intrinsic excellence. From a technical point of view, quality is known to be related to product compliance with technical standards. In a customeroriented approach, quality is a factor that is determined by the customers and their perceptions. It seems that this view is highly important in the definition of quality in services of special interest . Therefore, assessment of service quality should be based on the customer's perception. This view is consistent with the modern theory of quality in which the quality of the product or services is in accordance with customer needs, unlike classical theories that defined the quality standard by the degree of compliance with them. Considering university as a service organization, the quality of the training from the view of studies is here defined as the excellence in education , value added in education , fitting for purpose , consistent with the educational outcome , educational outcomes consistent with planned objectives, characteristics and needs, and finally, avoiding deficiencies in the educational process and meeting and exceeding the expectations of our customers . Service quality is a multi-dimensional concept and a function of the differences between expectation and perception along the quality continuum. Measuring service quality is a better way to dictate whether the services are good or bad and whether the customers will be or are already satisfied with it. One of the first measures to improve quality in any organization is based on the organization itself. Depending on the organization, the service quality dimensions are different. It is therefore necessary to consider the unique characteristics of each organization in the model. There are a few known models in the field along with service quality in Table 1. Explaining key concepts of service quality enables the managers to identify the nature of the problems and have better plans to improve service quality and thus improve the efficiency, profitability and overall performance of organizations . The first study on marketing services and service quality was conducted in the mid-1960s . There are two dominant approaches to service quality, namely the school of northern Europe and the school of North America that is based on SERVQUAL model. In Table 2, services quality models, definition of service quality and the main concepts of these models are tabulated. Many researchers have tried to change the content of SERVQUAL tools and operate the model in their organizations. Blau et al. and Sureshchandar et al. , for example, believed that the main drawback of this model is that the five dimensions included in the model (Tangibles, Reliability, Responsiveness, Assurance and Empathy) do not include all items required to achieve quality and thus cannot evaluate educational outcomes . The SERVQUAL tools are not suitable for evaluation of students. It has been found that based on the quantitative measurements, qualitative aspects of quality have not been checked [20,21]. Hoffman identified the most important backward effect of this tool to be the length of the tool and low validity of five dimensions, making it not comprehensive enough to predict the power of readmission [22,23]. Despite criticisms leveled against SERVEQUAL, this tool appears to be suitable for production facilities . Although it is used in a wide range of areas , the evidence shows that due to the nature of the education, the tools are not perfect for evaluating the quality of educational services . In industry, due to the clarity of the mission and consequently measurable quality, SERVQUAL is a good tool but education is a very complex mission and therefore definition of the quality is impossible in operational and measurable ways. Although in the concept of quality in higher education the role of clients who evaluate it at a particular time is significant, assessment process with quantitative methods is impossible even if there is consensus on the definition of quality [18,19,26]. On the other hand, industry usually faces a limited and specific level of stakeholders and customers such as teachers, learners, parents, the community, and the government. Quality is explained in higher education through the balance of power and authority of various stakeholders such as faculty, students, academic management, external stakeholders such as the government, and therefore quality assessment of education is a complex process, not certainly understandable using the qualitative and quantitative methods . On the other hand, despite similarities, higher education evaluations at the global level depend on local culture and structure of society under certain conditions. In measuring service quality in higher education, the meaning of the service quality depends on its position . By reviewing studies conducted on SERVQUAL model, it can be said that although SERVQUAL is widely used in educational institutions and many researchers have tried to considered such types of the operational models and tools to be relevant in the field of education because of the nature and extent of training customers, the complexity of the teaching-learning experience and also the lack of clear educational mission, SERVQUAL is not considered a perfect tool for assessing educational services quality. Thus, designing a model to explain and evaluate the quality of educational services is essential. The service quality models was found critically using review models (Table 2) the most important fundamental concepts of which are customer-orientation and thus customer satisfaction. Accordingly, one may argue that costumer orientation is the main thrust of the models and the underlying services quality. Based on the principle of customer-orientation, an educational system is designed according to the actual needs of the users of the services, not on the basis of theoretical designs and behind closed doors. One of the main concepts as a result of the improved quality of service is concerned with the concept of service satisfaction. With respect to satisfaction and satisfaction-related concepts and models doing a library research was essential. Therefore, an extensive review was conducted with the specific keywords to express satisfaction and generalized models in an educational setting. Under the new agreement, satisfaction models are divided into two types: objective and subjective. In objective models, the customer satisfaction is measured by indicators highly correlated with customer satisfaction. Subjective models, on the other hand, are based on their perception from the customer satisfaction. These models offer customer satisfaction approach that is closer to the perception of customers . Among the studied theories of satisfaction, theories complying with the current study were selected. The models of satisfaction, satisfaction definition and commonalities of these models that are brought to the field of educational services are presented in Table 3. 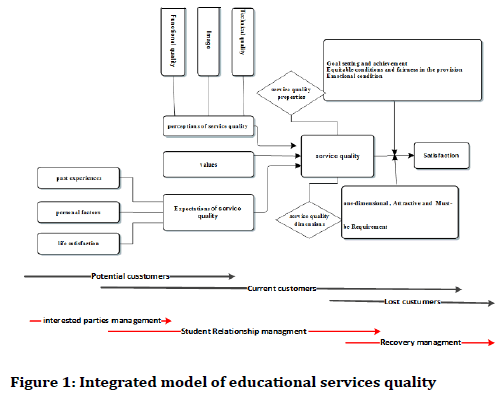 Relying on the literature review, satisfaction theories were defined, and models of service quality, satisfaction models in the field of education services were generalized, using the creative mental synthesis conceptual framework of educational service quality (Figure 1). In this model, the aim is to understand and explain concepts related to service quality and satisfaction. This model is composed of two parts, namely the service quality and related concepts; and satisfaction and its related concepts as a consequence of the process of improving service quality. Service quality is a combination of the main concepts of service quality models mentioned in Table 2. The model’s outcome is the result of relationship between the satisfaction and overall satisfaction obtained from the satisfaction models and generalizes models in the field of education shown in Table 3. Recognition of service quality properties (Intangibility, Inseparability, Variability and Perishability) is helpful in assessing the service quality. In order to improve quality in any organization, determination of the service quality dimension is an important step in designing service quality assessment. Service quality is obtained from expectations and perceptions of the analysis of the gap in service quality between students and education stakeholders, and the obtained values are the quality of educational services. Also organizational culture and image of the organization are among the factors that affect the perceived services by education stakeholders, including students. The expected services depend on individual factors such as past experiences, personal factors and overall life satisfaction. Satisfaction in this model includes pleasure states generated by the gap between expectations and perceptions with reality although the need is satisfied more easily and the goal is achieved in different situations for the individuals. According to satisfaction theories, factors such as goal setting and goal achievement, equity in education and training services, emotional and psychological conditions of the students and the organization and meeting the needs can be effective in the satisfaction of the academic students. Anyone who goes to college has outlined a specific purpose (getting a degree, enhancing knowledge, finding a better job, finding the perfect wife, earning more money, prestige, etc.). If students have already reached the pre-set goals, then they are likely to be satisfied from school. According to the spillover theory, when people are happy with their family and life in a peaceful environment, they would endure other problems in school and job environments better and would not perceive their school or occupation as too negative. In educational environments and at universities in particular, equitable conditions and fairness in the provision of services could transfer valuable feelings to students. According to Maslow's hierarchy of needs model, the most important needs of human are education. Lower levels of satisfaction with education involve providing the requirements such as an academic secure environment, respect, positive relationship, etc. According to Kano’s model, identifying educational requirements (one-dimensional Requirement, Attractive Requirement, Must-be Requirement) provides the opportunity for planning universities to direct resources to meet those needs such as educational success of students, university performance, classroom environments, training facilities and credit institution . Threshold attributes (Must-be qualities): These attributes are taken for granted when fulfilled but result in dissatisfaction when not fulfilled. Performance attributes (One-dimensional qualities) result in satisfaction when fulfilled and dissatisfaction when not fulfilled. Excitement attributes (Attractive qualities) provide satisfaction when achieved but do not cause dissatisfaction when not fulfilled. Based on the empirical findings, service quality precedes customer satisfaction. A review of literature implies that service quality is one of the main antecedents of customer satisfaction. Universities are known as industry-services organizations, hence meeting the expectations and needs of their customers is very important [30,31]. Academic institutions can develop similar strategies such as CRM from the experience of other companies [29,32]. In order to have a better communication with students and in an attempt to create their satisfaction and loyalty, universities today have turned to a new concept called Student Relationship Management. Their students are now considered as customers who purchase educational services from educational institutions in competitive environment. Therefore student relationship management (SRM) is a system to manage all aspects of student lifecycle . Today interaction with students is being operated in the form of Educational Management System portals like SAMA (System Jaame Moaavenate Amozeshe) in universities’ deputies for education. Studies in Germany indicate that students entering higher education, right from the beginning are provided with a life cycle that is called Student Relationship Lifecycle (SRLC). When students enter the university, it has three stages: entry, presence, and exit. In the entry stage, students are considered as potential customers while in presence, they are current customers, and in exit stage they are counted as lost customers. Appropriate to this stage, universities can use the Interest management, Student Relationship Management (SRM) and Recovery Management. The nature of most educational services is that the customer is present in the service delivery process. This means that the customer's perception of quality not only depends on the service output but also is affected by the service delivery process . Therefore in the management of educational processes at universities, customer-oriented attitude is important in the educational process. As a result, it can be argued that the educational service provider, customer relationship management concept known as Student Relationship Management and SRM deployment in these organizations, strengthens the relationship between students, professors, managers and industry, improves the quality of services provided to students and the university and ultimately enhances their loyalty to the organization than otherwise conceived [35,36]. Reviewing the models of service quality, customer orientation and satisfaction perceptions do play significant roles. An integrated model was designed to understand and explain concepts related to services quality and its dimensions and consequences of satisfaction with the service. Concepts and integrated models of education were discussed in the education area. This study was designed to provide an integrated model of educational services quality. This model is important in explaining Student Relationship Lifecycle (SRLC), Student Relationship Management (SRM), Customer Relationship Management (CRM) and Educational services management. For development of this model, experiences of experts, key informants and stakeholders about the quality of educational services and the perceptions and experiences of indigenous norms in this field are of high importance. This study should be an initial step to the next studied aimed at understanding the knowledge and experiences of stakeholders of the educational services quality. Sumsion J. Capacity building in early childhood education research in a regional Australian university. Brit J Educ Stud 2011; 59:265-84. Davies M, Hirschberg J, Lye J, et al. A systematic analysis of quality of teaching surveys. Assess Eval High Educ 2010; 35:83-96. Zanjirchi SM, Hajimoradi A. Auditing higher education institutions educational quality in format of total quality management model: Using fuzzy approach. IRPHE 2013; 18:25-47. Gunter HM. Thinking theory: The field of education management in England and Wales. Br J Sociol Educ 2000; 21:623-35. Getty JM, Getty RL. Lodging quality index (LQI): Assessing customers’ perceptions of quality delivery. Int J Contemp Hosp M 2003; 15:94-104. Peters TJ, Waterman RH. In search of excellence: Lessons from America’s best-run companies. New York: Warner 1982. McCaffrey DF, Lockwood JR, Koretz DM, et al. Evaluating value-added models for teacher accountability. Monograph, RAND Corporation, Santa Monica, CA 2003. Tang KH, Zairi M. Benchmarking quality implementation in a service context: A comparative analysis of financial services and institutions of higher education: Part II. TQM 1998; 9:539-52. Cheong Cheng Y, Ming Tam W. Multi-models of quality in education. QA Educ 1997; 5:22-31. Crosby PB. Quality is free: The art of making quality certain. Signet 1980. Grönroos C. Service management and marketing: Managing the moments of truth in service competition. Jossey-Bass 1990. Lehtinen U, Lehtinen JR. Service quality: A study of quality dimensions. Service Management Institute 1982. Parasuraman A, Berry LL, Zeithaml VA. Refinement and reassessment of the SERVQUAL scale. J Retailing 1991; 67:420. Netemeyer RG, Burton S, Johnston MW. A nested comparison of four models of the consequences of role perception variables. Organ Behav Hum Decis Process 1995; 61:77-93. Seth N, Deshmukh SG, Vrat P. Service quality models: A review. Int J Qual Reliab Manag 2005; 22:913-49. Yavas U, Benkenstein M. Service quality assessment: A comparison of Turkish and German bank customers. Cross Cult Manag 2007; 14:161-8. Blau PM, Scott WR. Formal organizations: A comparative approach. Stanford University Press; 2003. Sureshchandar G, Rajendran C, Anantharaman R, et al. Determinants of customer-perceived service quality: A confirmatory factor analysis approach. J Services Mark 2002; 16:9-34. Kitchroen K. Literature review: Service quality in educational institutions. ABAC J 2004; 24. Guo X, Duff A, Hair M. Service quality measurement in the Chinese corporate banking market. IJBM 2008; 26:305-27. Karatepe OM, Yavas U, Babakus E. Measuring service quality of banks: Scale development and validation. J Retail Consum Serv 2005; 12:373-83. Kayastha A. A study of graduate student satisfaction towards service quality of universities in Thailand. Webster University, Thailand, 2011. Arasli H, Katircioglu TS, Mehtap-Smadi S, et al. A comparison of service quality in the banking industry: Some evidence from Turkish-and Greek-speaking areas in Cyprus. Int J Bank Mark 2005; 23:508-26. Hendrickson B, Rosen D, Aune RK, et al. An analysis of friendship networks, social connectedness, homesickness, and satisfaction levels of international students. Int J Intercult Relat 2011; 35:281-95. Voss R, Gruber T, Szmigin I, et al. Service quality in higher education: The role of student expectations. J Bus Res 2007; 60:949-59. Soutar GN, McNcil MM, Lim K, et al. Service quality in educational institutions: A foreign student view. J Mark Higher Edu 1996; 7:85-94. Madhoushi M, Zali MR, Najimi N, et al. Building the house of quality in higher education. Quart J Res Plan Higher Edu 2009; 15:121-54. Nadiri H, Kandampully J, Hussain K, et al. Students' perceptions of service quality in higher education. Total Quality Manag 2009; 20:523-35. Shaik N. Marketing distance learning programs and courses: A relationship marketing strategy. Online J Distance Learning Admin 2005; 8. Sun Y, Duan W, Du Y, et al. A novel synthesizing method of alternative priorities for benefits, opportunities, costs and risks with the analytic hierarchy and network processes. J Conv Info Tech 2013; 8:896. DeShields Jr OW, Kara A, Kaynak E, et al. Determinants of business student satisfaction and retention in higher education: Applying Herzberg's two-factor theory. Int J Edu Management 2005; 19:128-39. Lemon C. Challenges in marketing and student relationship management in higher education. Retrieved March 2004; 3:2005. Piedade MB, Santos MY. Student relationship management: Concept, practice and technological support, In Engineering Management Conference, 2008. IEMC Europe 2008, IEEE International 2008; 1-5. Hilbert A, Schönbrunn K, Schmode S, et al. Student relationship management in Germany–foundations and opportunities. Manag Revue 2007; 204-19. Ali DMM. Role of data mining in education sector. IJCSMC 2013; 2:374-83. Samavi H, Rezaei-Moghaddam K, Baradaran M, et al. Customer-orientation and its application in higher education system: The case of agricultural higher education in Khuzestan province. Quart J Res Plan Higher Edu 2008; 14:121-43. Citation: Soleiman Ahmady, Shahram Yazdani, MohammadAli Hosseini, Dariosh Rokhafroz*, Abdolreza Gilavand, An integrated model of educational services quality, J Res Med Dent Sci, 2019, 7(1): 7-13.